About a month ago, the Economist came out with an interesting article titled “The Innovation Game.” I was fascinated with the question of using data to determine the most innovative country. Innovation is sometimes measured by lag measures including volume of patents granted each year, business revenue or the amount of funding received for research. I find these lag measures lacking in the breadth of how we discuss innovation. The Global Innovation Index was created by the World Intellectual Property Organization to examine the innovation capacity of nations. The framework for the Global Innovation Index includes five input pillars that encourage innovative activities: 1) Institutions, 2) Human capital and research, 3) Infrastructure, 4) Market sophistication and 5) Business sophistication. Data are based on the UNESCO-UIS Science & Technology Data Center. I think it would have been nice to know how these pillars were chosen and if they were accurate measures of innovation. Perhaps this is the “informed skeptic” in me to question the questions the data answers as I discussed in my September 21 article. 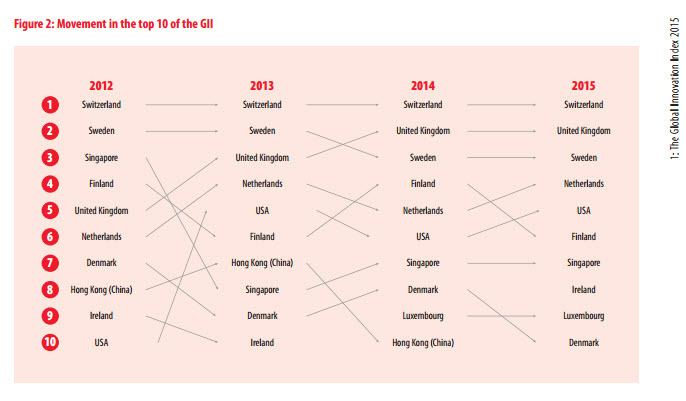 The report cites Switzerland, the UK and Sweden as having the highest raw Global Innovation Index score for high-income economies and China, Brazil and India as having the highest raw score for middle-income economies. The rankings are grouped in several other different ways throughout the study and the study includes an all-out assault on the eyes with its numerous red graphics. I agree with the authors of this report that we should be discussing ways to expand the concept of innovation to be more general and horizontal in nature to include not just technology innovations but also social and business model. The focus on creating an ‘innovation culture’ with businesses, students, and society at large is critical to our economy and to achieving public participation. Key takeaways from this data include an appreciation for the complex nature of innovation and to continue refining metrics to measure it throughout the world’s economies. Next Would New Apps Reduce Gluten-Free Costs?